Most of you know Jonas Klingberg, and Friday August the 10th, the first time efter the summer break he will be in Copenhagen and teach 5Rhythms together with me. If you do not know Jonas I can tell, he is a wonderful 5Rhythms teacher from Stockholm and teach all over Europe and other places. All (adults) are very welcome, all can dance - each dancing our own dance. We can all inspire each other to movement and presence, no matter who you are and what you bring to the dance floor. Dance your joyful dance and move your dance of sorrow. Move the body and re-create space to the one you are deep inside. Always a journey into known and unknown paths to freedom in your body, heart and life. The 5Rhythms is a simple and yet deep dance praxis. The dance grows from inside and develop your expression, your creativity, your awareness and your healing. We’ll dance through the 5rhythms: flow/the power of being, staccato/ the power of loving, kaos/ the power of knowing, lyrisk/ the power of seeing og stilhed/ the power of healing. The dance is your expression; there is no right and no wrong dance, only the dance itself, as it unfold through you. The rhythms are the structure, which allow you to find new forms and paths in the dance. Just come and pay on the door. You are wellcome from 6.45 PM, there will be a person at the gate, Kapelvej 46 from 6.45PM. We start on time 7PM, så please be on time. 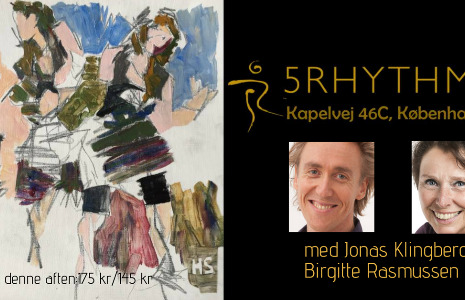 5Rhythms teacher: Jonas Klingberg, certificeret by Gabrielle Roth and Birgitte Rasmussen, certified by Gabrielle Roth. Price - speciel price this FIRST night: 175D.KR or 145 D.KR when unemployed, on pension or student. You can pay cash or mobile pay. No Signing up - just come and pay at the door. Remember water bottle and clothes in layers, we dance in bare feet (no socks) or dance shoes.